Combo includes Benjamin 392 rifle with an UNmounted Leapers 4x32AO scope, Weaver rings and intermount with Picatinny rail! Scope and mount are not installed on this gun. An American classic! 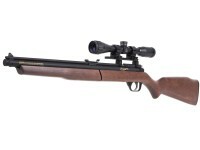 The Benjamin 392 .22 cal. rifle is a multi-pump pneumatic. The hardwood Monte Carlo stock is sleek and lightweight. The rifled brass barrel is finished in black and sends pellets out the muzzle up to 685 fps. You can vary the velocity by the number of pumps (up to 8). The 392 has the power and accuracy to take small game and pests, but you'll find yourself picking up this rifle every time you want to plink or shoot spinners. This gun does not come equipped for a scope from the factory, therefore our specs have it listed as unscopeable. 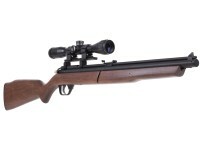 To scope this gun, you have to purchase an aftermarket rail or an intermount. This model comes with both a rail and an intermount. Things I liked: I love it!!!!! Things I liked: As expected great gun!! Things I liked: I was familiar with the product, having owned a Blue Streak from around 1970. 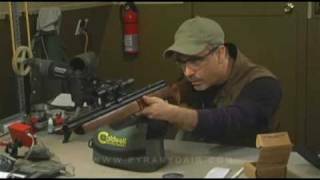 The rifle is every bit as accurate, as the early model Blue Streak, I own. The scope mounting accessories, worked great. Shipping time was excellent. Things I would have changed: I wasn't that crazy about the scope. It had some issues. Pyramyd Air, is working with me to rectify the problem. Several had recommended upgrading to a variable magnification scope, and that seems like a good idea.The trigger, is very stout. There are some mods on the Web, I think I may try to reduce the pull. What others should know: The rifle seems to want to retain some air, pumping over 6 pumps. Usually, about one pumps worth. I was cocking and dry firing the rifle one time, so I could start charging an empty cylinder, when sighting in the scope to maintain some repeatability. I'm hoping this will heal itself, as it gets broke in. I'm also planning to try some lighter weight pellets, to see if that may make a difference. I've been using the JSB 15.89 Diablos. 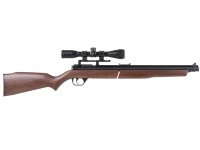 This rifle is capable of plinking doves, as far out as 70 yards, if you do your part. I was checking distance, with a range finder I have. I only want to buy The Air Venturi Intermount and Weaver/Picatinny rail. What are the parts numbers? Does this Combo come with a case or do I have to buy the case separately? Isn't there any way to mount the scope lower? 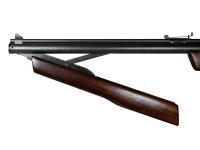 Crosman did not provide a proper grooved receiver on the 392/397 models. They sell a not quite so ridiculous clamping onto the barrel mount (which may be the lower component of this package) that is a bit better but still poor IMO. The mounting in this package is an abomination. 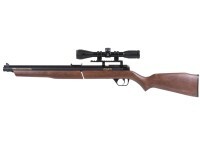 Classic multi-pump pneumatic that's ideal for hunting small game. Includes 4x32 Leapers scope, Weaver rings, intermount and Picatinny rail (scope and mount are not installed).